It’s hard to believe that, since his debut in 1987 Outback has been released eight times domestically. He’s also been the member of two different sub-teams. 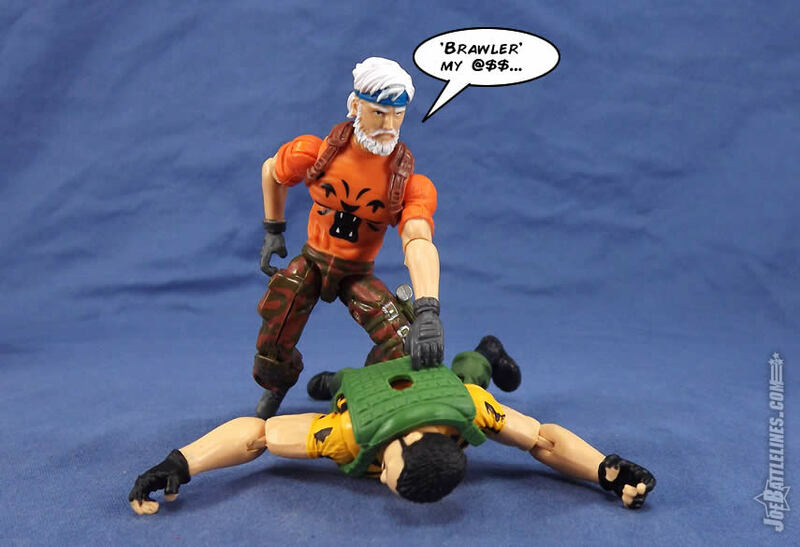 (Night Force and the Joe Con Zombie Hunters) His Battle Corps releases seem to have been generally forgotten by the fandom and his Direct-to-Consumer version seemed to have been the victim of some serious steroid injection. 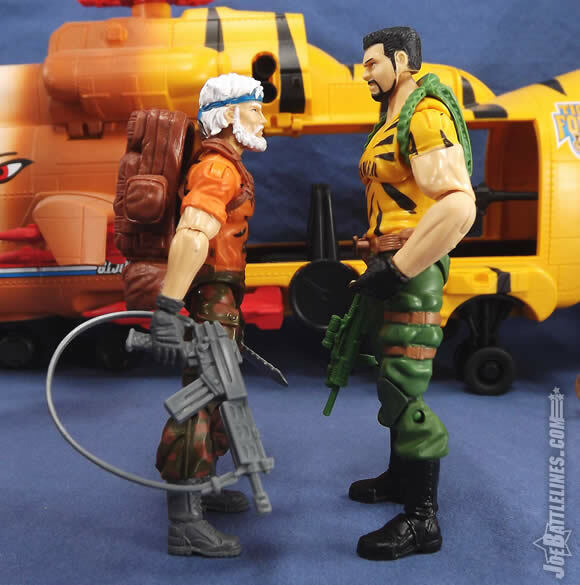 (The same might be true of this forthcoming 2016 Hasbro release as well!) However, as distinct as those versions might have been there’s still one design for Stewart Selkirk that has truly captivated fans over the years. 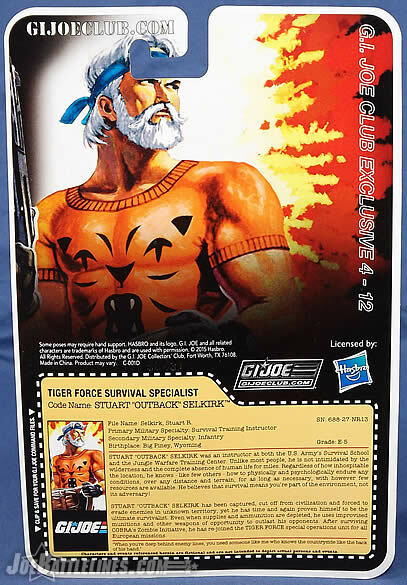 That’s right, I’m talking about the European exclusive 1990 Tiger Force Outback . Oh crap—it just hit me. 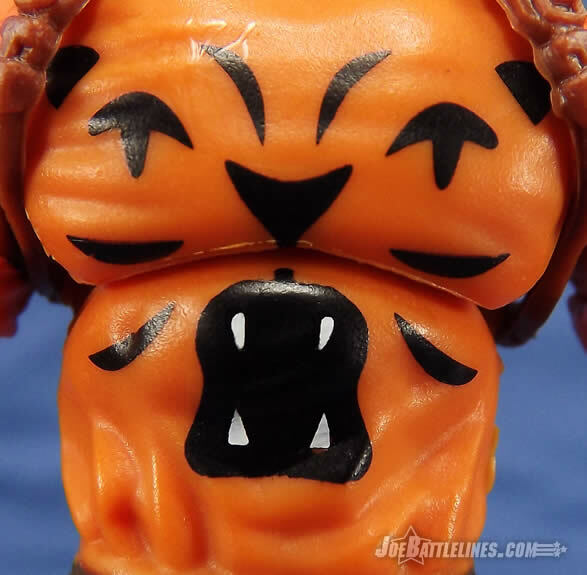 I’m reviewing a cat-themed figure with Chris. Sigh, it’s going to be a long night… Indeed it is! Just be glad I’m not keen on these, otherwise I might be wearing my tiger guising suit right now. While the new head is much appreciated---especially because it’s sized correctly, it ironically makes the rest of the body look disproportionate because the body is so. The Club went real lazy on the rest of his build. 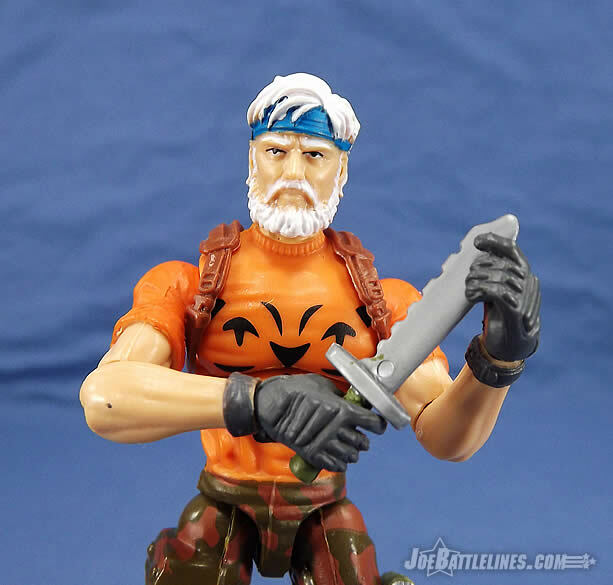 Basically the same parts as the Cobra Island 7-pack version, except better arms complements of Retaliation Flint. I’m sorry, but improved arms aren’t going to help fix a woefully compressed and scrawny torso and short legs. And look at that waist! It’s skinnier than my sister’s, and that’s sayin’ something because my sister’s waist is tiny! 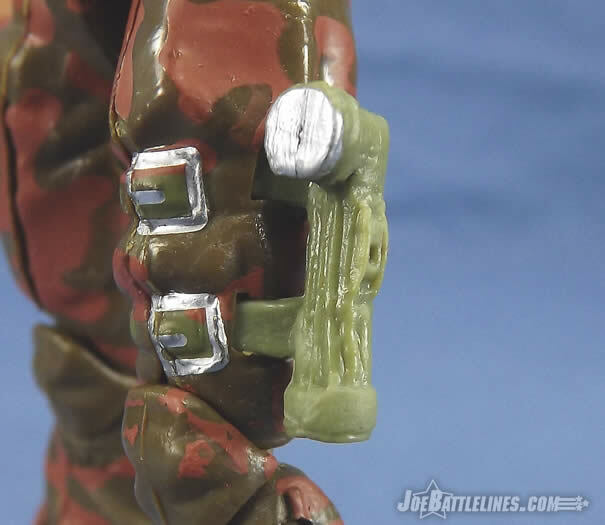 Then he has those unflattering low-rise pants… The Renegades Law torso should have been used. That way he’d still have the T-shirt, but also a longer and more properly muscled chest. I’ll admit that I was initially a bit disappointed in the recipe the Club used to produce the body of this figure as well. Don’t get me wrong—I like the fact that there’s some consistency in the design between the 25 th versions and this on but I feel that this was the Club’s chance to address some of the issues that fans had with the previous release. 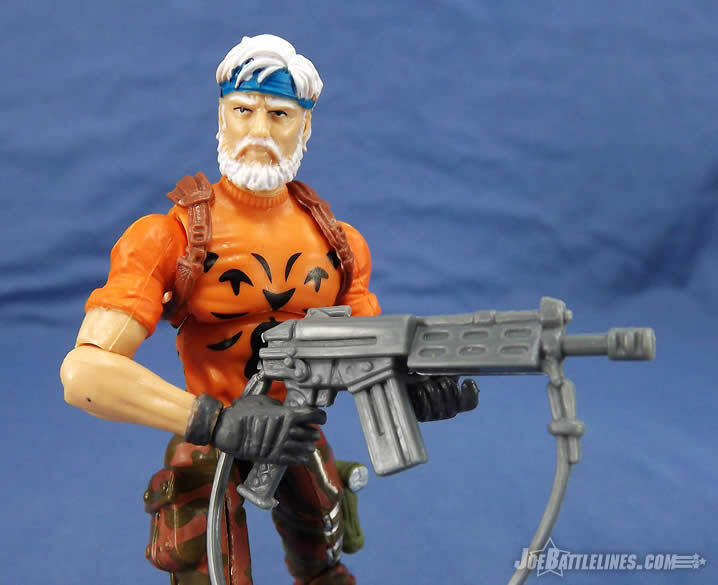 The new arms are a WELCOME addition; as are the hinged wrists, which are, in my opinion, something that should be included on EVERY GIJCC build. 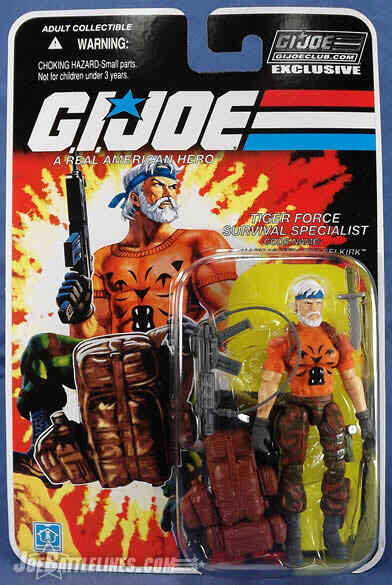 However, I almost wish that the designers had decided to shake things up a bit more by using a different torso and legs. 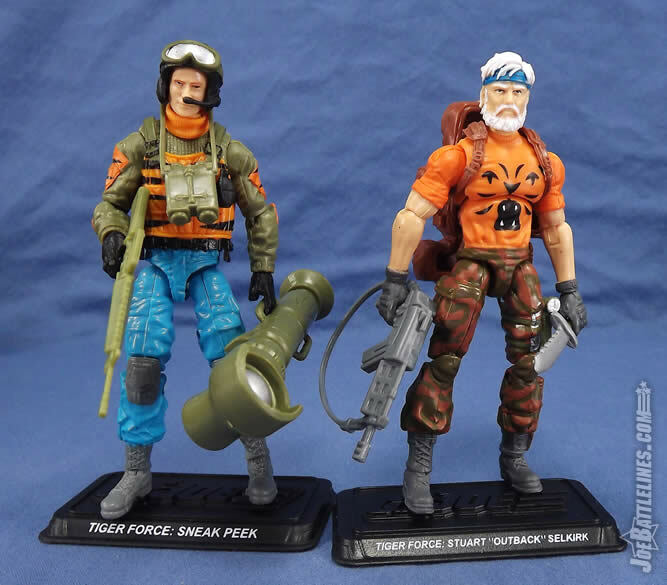 This way, the Tiger Force version would feel even more unique when compared to his contemporary brethren. 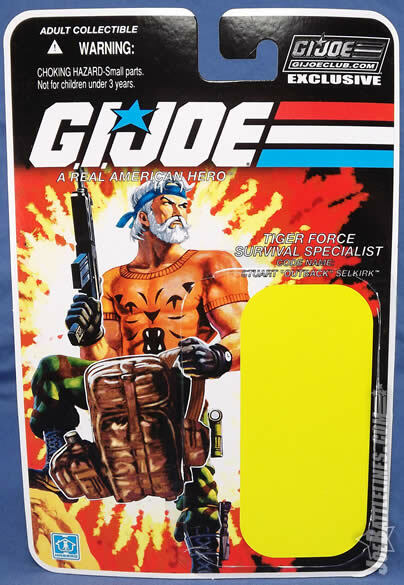 Still, I like the build for what it is—a representation of a guy who is all lean muscle in a T-shirt and BDU pants. As such, I’m pretty happy with the body overall. (I usually seem to contrast with Chris on these type of points anyway—why stop now?) You just haven’t gotten down that finicky cat-like aspect yet. Give it time. The new head is a pleasant surprise. The Club didn’t have to go this route and yet, in an instance where they could have cut corners, they didn’t. I’m not entirely certain of the rationale behind the decision but I like the results! Indeed. As another positive, the deco is at least very true to the original source material, and the Club actually made the shirt better by adding stripes to the back; which was left solid orange on the original. Color (pun intended?) me officially impressed—both with Chris and the Club. 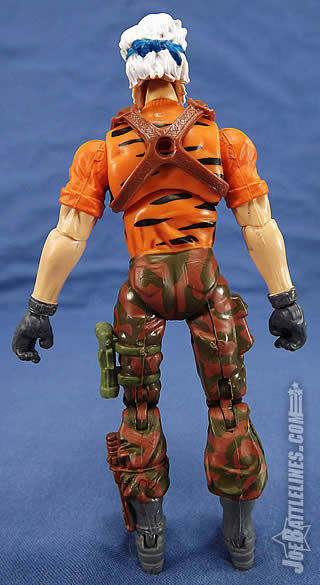 I offer praise to the latter for not only recreating the vintage Tiger Force Outback deco but also for improving upon it by including the back striping. Seriously—people (myself included) give the Club flak for the appearance of cutting corners at times and yet here, where they had the perfect opportunity to do so, they instead went the extra mile. Very nicely done! Fred, I guess for me; I’m still frustrated we still haven’t gotten thee signature Outback in modern format. 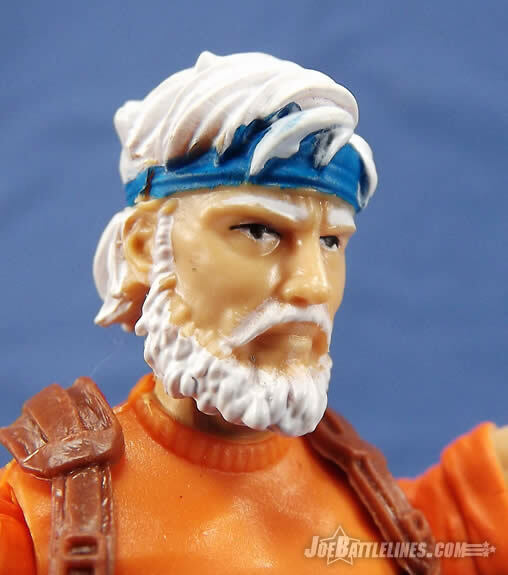 I’ll cut the 25 th versions some slack because that was an untested fledgling line geared for 3 ¾”, even if that was supposed to be Chuck Norris. 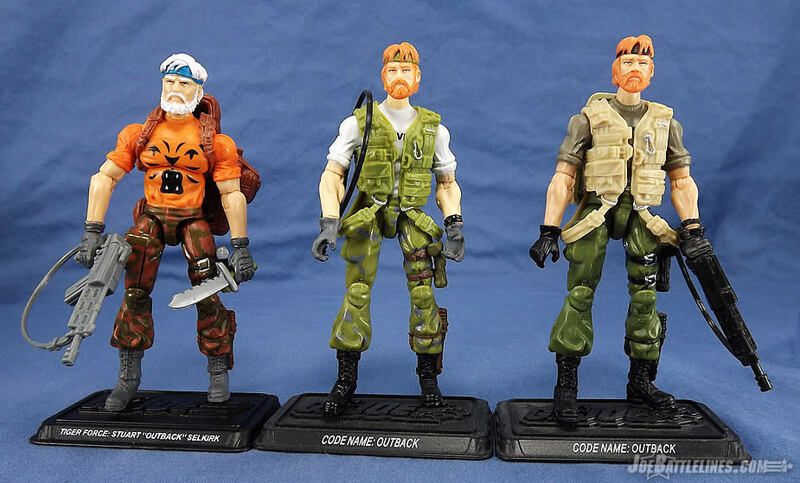 But the 4” Zombie Initiative Snow Job... err, I mean “Outback” was akin to a wet furball hacked up on the kitchen floor, and the upcoming “black ops” Outback this November is also unimpressive with the reused tiny 25 th head instead of this new one. I don’t have the problem with the previous ARAH generation 3 Outback designs that Chris does save for the molds used for the hands. However, I will agree that I’m not uber keen on the upcoming version only because I feel that it bulks up Outback too much. When I think “survivalist” I think someone is more lean muscle Bear Grylls as opposed to Arnold Schwarzenegger. However, I’ll leave that discussion for another time as the tangent train has officially left the station! 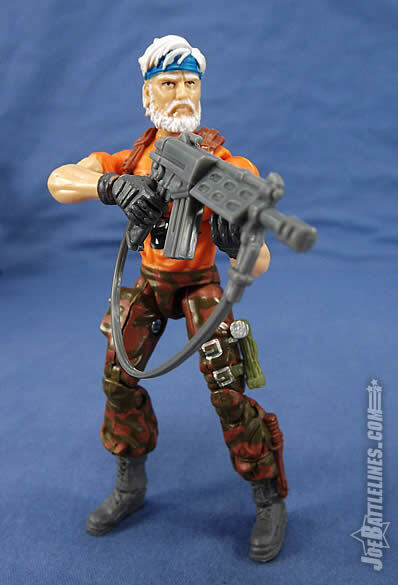 Outback still carries his trademark shortened paratrooper configured G3 rifle, and a knife originally from DTC Spirit. Shoulder straps, a removable flashlight, and a backpack finish off his gear. Not much, but enough. We should add the shoulder straps don’t line up with the backpack hole on the body, but it’s actually unnecessary to do so because it thankfully doesn’t hinder mounting a pack on him. In terms of kit, I’m perfectly content with the gear packed with Outback. 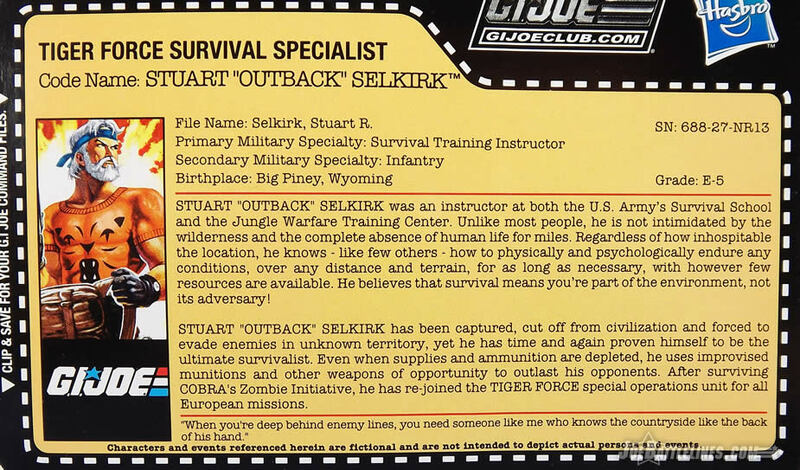 I’ve never seen Specialist Selkirk as much of a pack mule. Instead he’s the kind of trooper that carries just what needs and nothing more. 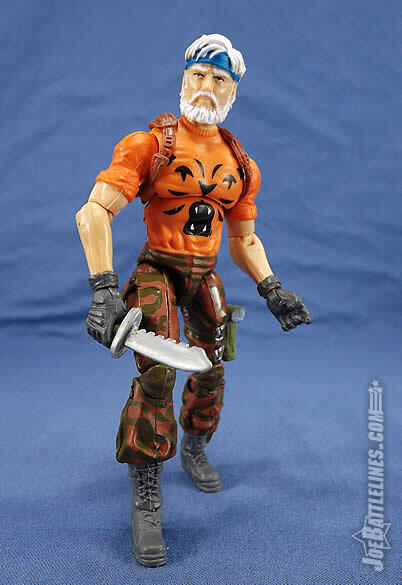 The included kit evokes the one include with the vintage figure and I love the inclusion of the large survival knife which I feel is of more use to Outback than his rifle. Again, the kit is exactly what I would have expected the character to carry. 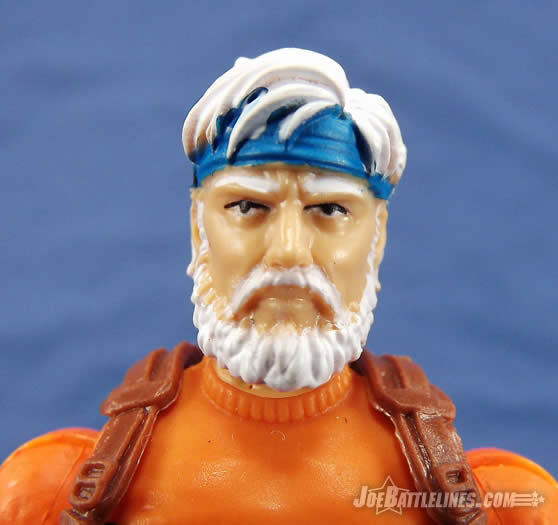 As an additional accessory, I’ve always wanted an Outback to include two heads: One a clean shaven, short-haired “garrison” version, and the other a long-haired bearded Grizzly Adams“I’ve been out in the bush for the last sixmonths!” look. In this case, it would have been super cool if the Club would have also included the same head, but painted with his normal red hair. That way we could swap out the white for red if we wanted him to look younger. But alas, that wasn’t the case. 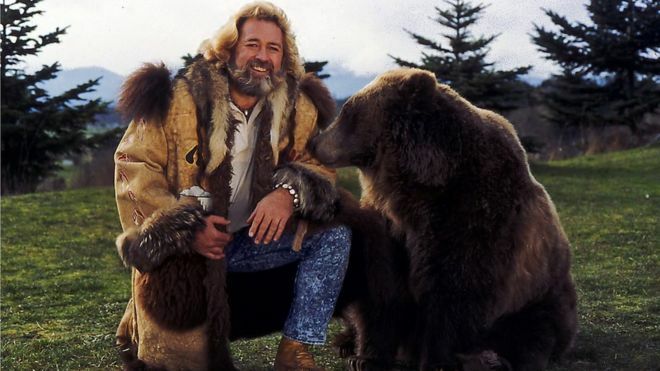 While it’s safe to say that Dan Haggerty ’s portrayal as the title character in the Life and Times of Grizzly Adams was “THE BOMB”, wishing for a second head is a pipe-dream. 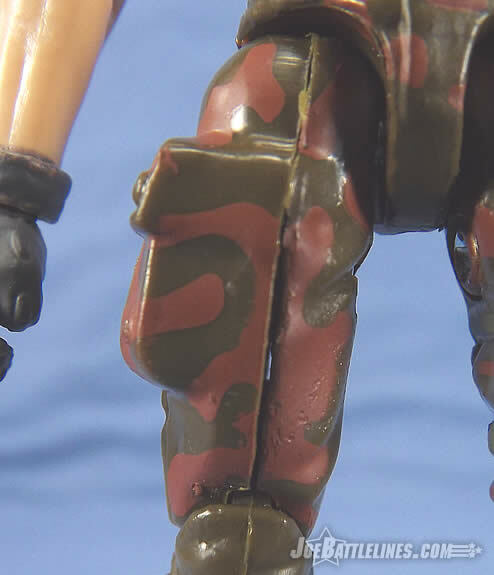 The list of modern figures that have been packaged with multiple heads is a very short and not one of those figures was released by the GIJCC. I’m sure that production costs are a factor—especially in a year when newly tooled parts seem to be fewer in number. True. And to be fair, there are other things that the Club could do that would be even more super cool that haven’t been done yet either. But maybe now they will since they have been given a two year extension of life with only G.I. Joe as their focus. Overall I’m not thrilled with this figure. 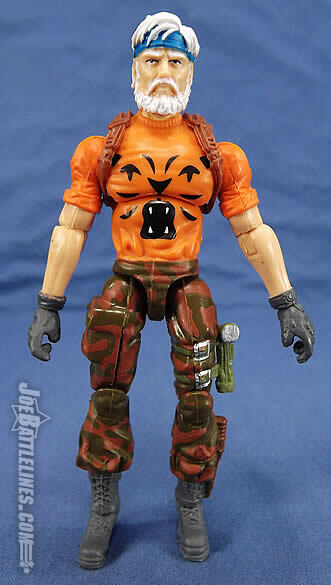 While I love the new head, sadly the rest of the figure was a wasted opportunity because antiquated parts were used. (Exactly the same problem we had with Claymore a few years ago who also had a brilliant new head stuck on a diminutive and disproportionate body.) 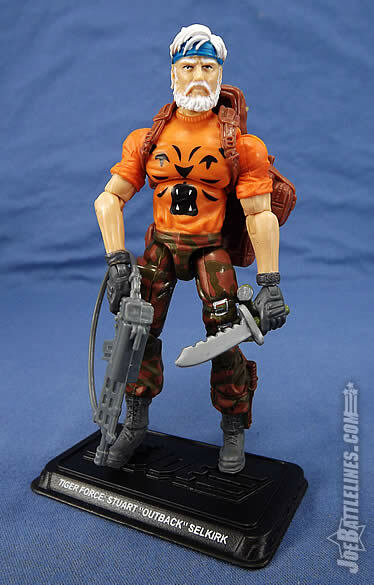 What ruins it for me completely, is, I can’t even swap out parts because the shirt is the signature hallmark of the figure. 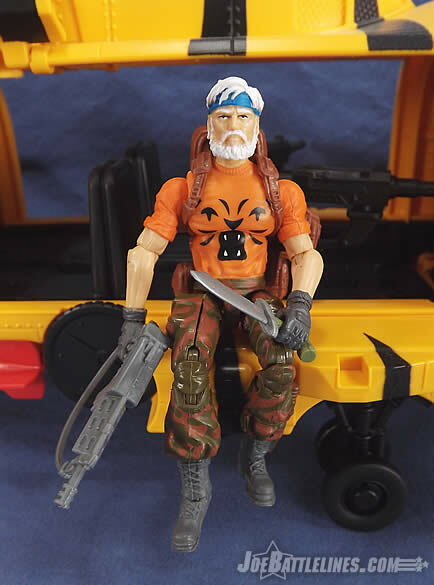 I suppose the new head gives just enough merit to me personally that I’ll keep it and use the head elsewhere (and repainted), but for those of you who are not Outback or Tiger Force fans, save your money until someone actually does justice to this character. 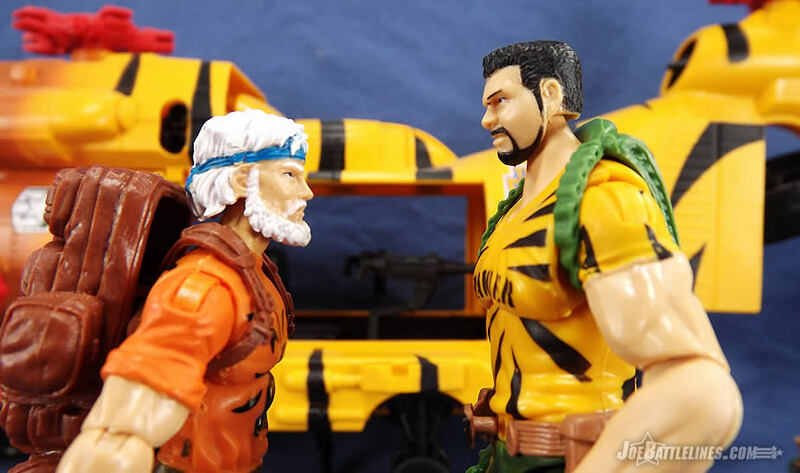 The Bottom Line: While the construction is somewhat predictable, a brand new head and a fun deco make Tiger Force Outback a solid addition to any modern style G.I. Joe Collection!